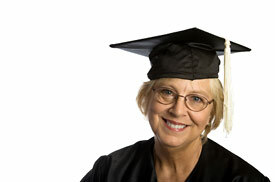 The AARP Foundation announced a call for entries for its second annual Women’s Scholarship Program, which will provide funds to women ages 40 and over who are seeking higher education. The Foundation states that older women lack resources later in life because they earn less. Must have low to moderate income with limited financial resources. Be enrolled in an accredited, post-secondary school (public or private) or training program within six months of the scholarship award date. Women who have been out of the workforce for an extended period. Women raising the children of another family member (such as grandparents raising grandchildren, or those raising siblings or nieces/nephews). Women in dead-end jobs (those with no opportunity for advancement, low pay and lacking either health or retirement benefits). The Program does not provide assistance for graduate school and is available to U.S. citizens only. One-hundred scholarship awards will be given, with funds ranging from $500 to $5,000. Interested applicants can submit their applications at http://www.aarpfoundationwlc.org from July 1, 2008 to August 22, 2008; the awards will be given in early 2009. Are You Left Out in the Cold With the New College Student Loan Legislation?